Heathrow expansion is the one big project where Labour could combine with rebellious Tories to show they take climate change seriously, says Jenny Jones. Heathrow expansion is the single most polluting project promoted by the UK government – but on Monday many Labour MPs will be joining those Conservatives who are obeying the government whip to push it through. The extra noise and air pollution will impact on millions of people – but it’s the damage it will cause in increasing climate change which will ultimately devastate the economy and threaten the future of humanity. None of those MPs voting for Heathrow expansion should ever be taken seriously when they say they want a better environment. They are voting to expand an already worrying air pollution hot-spot: they are voting for hundreds of thousands of people to suffer a tsunami of noise coming from an extra 700 planes a day. They are voting for shrinking ice caps and rapidly rising Arctic temperatures. 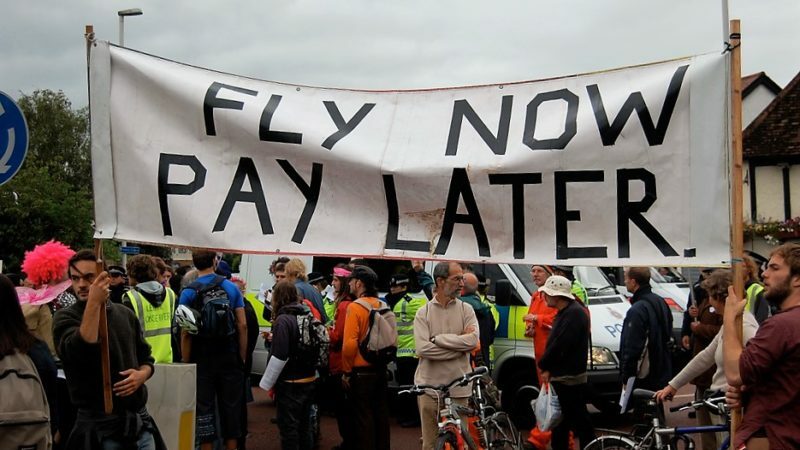 The promises of mitigation measures to make Heathrow expansion more palatable have yet to materialise – with the only certainties being a bigger Heathrow car park – and taxpayers paying the bill for the millions of pounds spent on transport infrastructure to get travellers to the airport. Please lobby your MP this weekend and try to convince them not to vote for Heathrow expansion. As Greenpeace have pointed out with their campaign, many Labour MPs are undecided and many Conservative rebels need a bit more backbone. Labour are formally opposed to the scheme as it does not meet any of their four criteria – but they are allowing a free vote. This is mostly due to the influence of the Unite union, who sponsor many Labour MPs. To counter this union lobbying, a group of activists went on hunger strike outside the Labour Party HQ this week, arguing that there are no jobs on a dead planet. Their key demand was that the shadow cabinet impose a three-line whip to oppose Heathrow expansion. Sadly, Labour is putting narrow economic interests before the environment. I know Corbyn’s top team are long-term opponents of Heathrow expansion. So what is the good of having them leading a party that gives a free vote on a project that has such a huge impact on people and planet? That’s not leadership. It reinforces my sense of disappointment that Labour remains committed to a set of old fashioned and out of date schemes like Trident and Hinkley. I had hoped that Corbyn would be able to make more of a difference – but I’ve first-hand experience in the Lords of how Labour sidelines the environment and animal welfare. The unions have lobbied hard for Heathrow, but let’s remember that the profits from Heathrow expansion will go to a foreign-owned company, with half of the new passengers of this giant hub airport never making it beyond the shopping mall. Basing the economic prosperity of your regional economy on one of the most polluting industries on the planet is not ideal, but many northern and Scottish MPs have been spun a yarn about the knock-on benefits of a hub airport – without any government guarantee that these will materialise. Heathrow expansion is the one big project where a united opposition could combine with rebellious Conservative MPs to show that they take climate change seriously. I hope those wavering MPs do the right thing and they sink this awful scheme. Baroness Jenny Jones is a Green Party peer and writes regularly for Left Foot Forward.